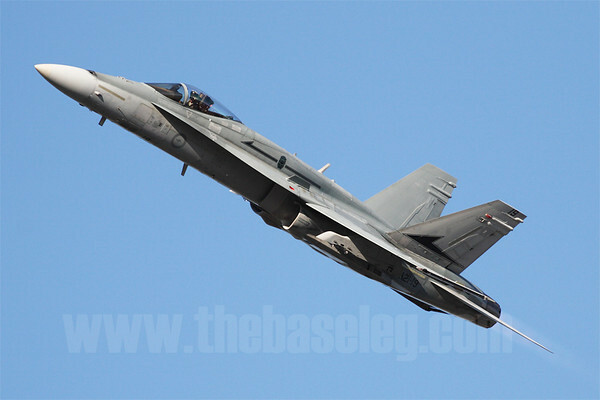 Royal Australian Air Force F/A-18A Hornet. Eight Royal Australian Air Force F/A-18 Hornets have flown into Western Australia as part of the security operation to protect the gathering of world leaders during next week's Commonwealth Heads of Government Meeting. The fighter jets, from Williamtown in NSW, will be on standby at RAAF Pearce, just north of Perth, throughout the CHOGM. The commander of the task force charged with providing security for CHOGM, Rear Admiral David Johnston, said the Australian Defence Force would also have surveillance aircraft (presumably the Wedgetails of the 2 Sqn, also normally based at Williamtown) available for monitoring the airspace in and around Perth for the duration. He said the pilots of the Hornets would carry out training missions over Perth in coming days to ensure they were familiar with the city. According to Australian planspotters monitoring air traffic control frequencies, the Hornets tasked with protecting the CHOGM have been drawn from 3 Sqn.